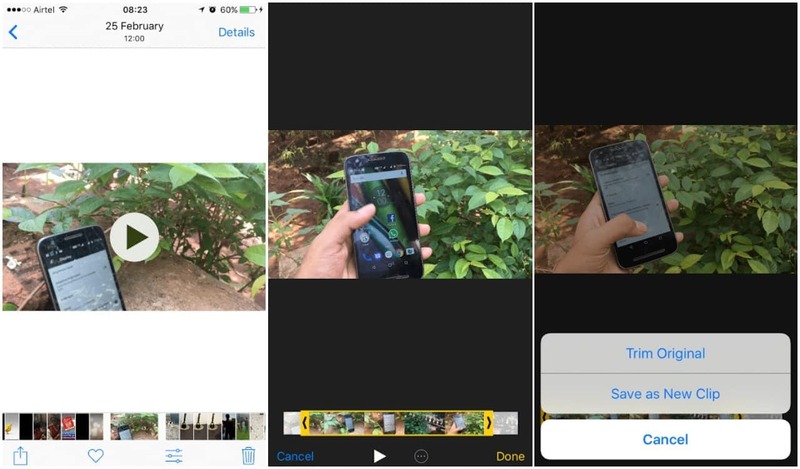 The best editor helps you easily shorten iPhone videos with powerful features. Either for sharing or getting your message across, videos on iPhone need to be concise and short. Sizes will matter the most. You made a great video on your iPhone, and you simply want to extract out the best bit. For this purpose, you need to shorten or resize the videos on iPhone, making sharing much easy. Then, to have a manageable file size, iPhone built in editor is hard to ignore. Yes, it does what is desired. And does it excellently. Photo application is not just a simple photo editing tool. But it is also a very good video size reducer. You can trim the video, change start and end, cut some parts or just keep a portion which you want to share and delete rest. It is easy. So for iPhone, iPad, or iPod touch follow the steps. Click done, and choose either "Trim original" or "Save as new clip"
iMovie is another simple application to use. Solid design, simple usage and intuitive multi-touch gesture makes this app an all time winner. Especially when you are answering " how to shorten a video on iPhone? Despite its editing capabilities, we will keep our focus on video resizing. It's a video size reducer, that can import file directly from iPhone. There are many options to trim, rotate, duplicate, split or delete clip. By default a photo in a timeline will be a clip for 6 to 12 seconds of onscreen time. Trimming photo will mean cutting the on-screen duration. But, it can be, that you don't want to delete parts at all. Instead you want to make "large" size a little bit more manageable. For that sake, another way to trim video, iPhone camera roll has ,is, by resizing. But resizing and compressions are tricky. You need to consider video dimension (pixels), aspect ratio and resolution. Above all resizing doesn't mean sacrificing quality. One best way to do that is to use Desqueeze. It can resize photos and videos to any size up to 8192 px and 4k respectively on iPhone. It can make file size smaller and that too with precision. Another utility is that, compression and editing will be applied to the batch (all photos and videos selected). Now use sliders at the bottom to adjust video compression. The compression will start on the targeted video file. Being an iphone, iPod or iPad user, you can enjoy making high quality photos and videos, including 4K,1080p and 720 resolutions. But the downside is the large file size which makes them hard to retain. There are options to shorten or resize the iPhone videos and photos, by using any of above applications. Get a snippet or make size manageable, depending on "what you want". Just keep sharing the fun!